Peeling and deveining shrimp is a thankless task. Unfortunately, it’s a critical step for those of us wont to avoid the prepared food section. After all, you can find shrimp already peeled, deveined—even butterflied. But there is something satisfying about having done it all yourself; somehow, it makes the final dish taste all the better. Start by removing the shell, then carefully slice along the back of the shrimp and use the tip of your knife to remove the intestine. If you’d like an extra-fancy presentation, try butterflying the shrimp. 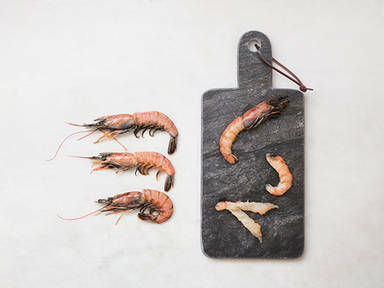 Simply remove the head and shell until the tail, then cut the shrimp in half lengthwise until you reach the tail shell. Simple as that!